Take off your shoes and step in to this soothing and refreshing foot soak. 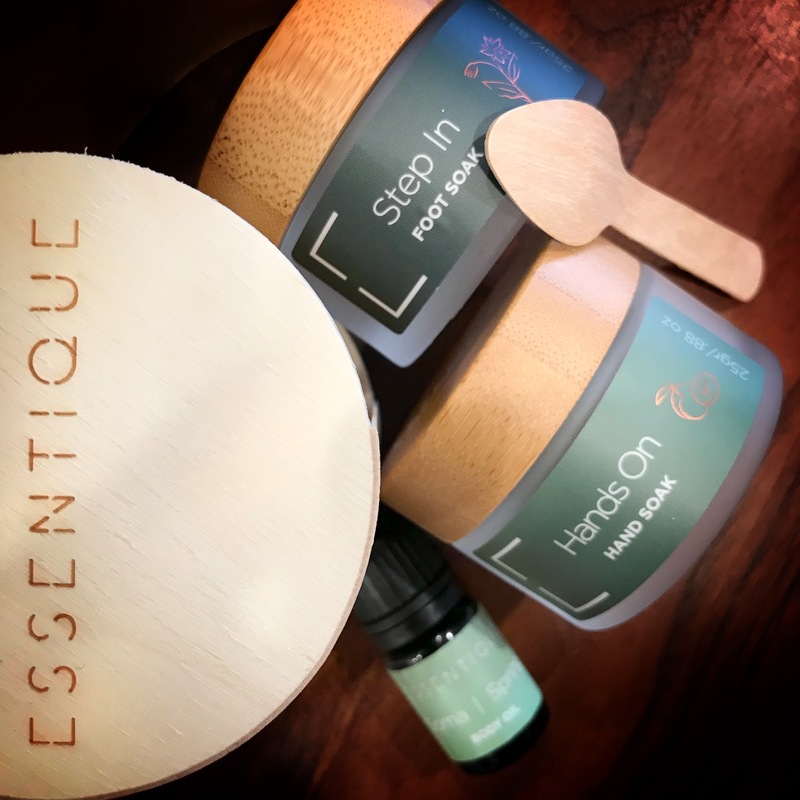 Formulated with colloidal oatmeal, coconut milk, honey, baking soda and marshmallow root, this foot soak exfoliates and softens your tired feet. Colloidal oatmeal soothes stressed and dry skin. Coconut milk promotes a healthy glow and honey is loaded with antioxidants and enzymes that nourish, cleanse, hydrate and heal the skin. Baking soda is a natural exfoliator that removes dead skin cells. Marshmallow root has intensive hydrating, softening and balancing properties. Eucalyptus is antifungal and antibacterial. Lemon is antiseptic and helps heal broken capillaries and varicose veins. Peppermint contains antiseptic properties and may decrease inflammation. Rosemary relieves cramps and may ease arthritis. Tea tree contains antibacterial and antifungal properties that may fight nail fungus. Lavandin grosso is a calming, antifungal oil that helps relieve nervous tension. Add a tablespoon to a foot basin filled with warm water. Step in, and soak your feet for 10-15 minutes. Rinse and dry feet. Follow with SOMA body oil. You may also bring it with you to your spa for a relaxing pedicure. Remember to care for the hardest working part of your body — your hands! 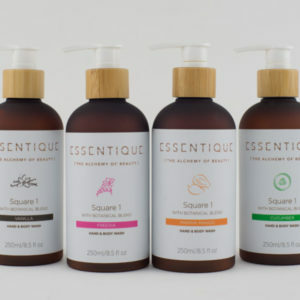 Formulated with colloidal oatmeal, coconut milk, honey, baking soda and marshmallow root, this hand soak leaves your skin feeling soft and supple. Apricot kernel oil is deeply moisturizing, helps heal wounds, relieves inflamed skin, and promotes elasticity and suppleness. 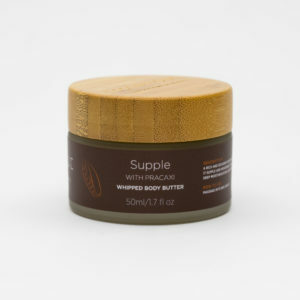 It is quick-absorbing and especially good for use on mature or dry skin. 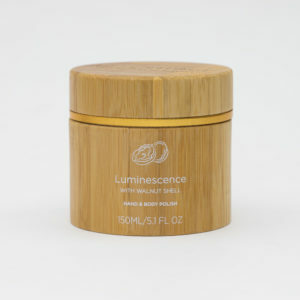 Frankincense decreases inflammation and is soothing to dry, irritated skin while revitalizing mature skin. Lavender is calming to the senses, relieves sunburn and scrapes, is anti-inflammatory and may ease arthritis symptoms. Lemon is uplifting, antiseptic, and may ease joint swelling. Geranium helps heal scar tissue, tones the skin, and may calm eczema. Ylang ylang is very beneficial to aging skin. Add a teaspoon to a bowl of warm water. Soak your hands for 5-10 minutes. Rinse and dry hands. 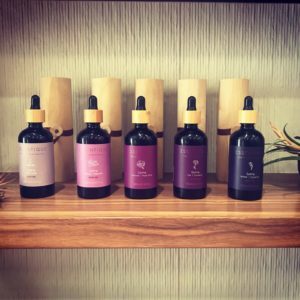 Follow with SOMA body oil. You may also bring it with you to your spa for a relaxing manicure. Soma, a truly luxurious body oil, leaves skin feeling hydrated, nourished, and smooth. This lovely oil contains unique and prized flower essences that intoxicate the senses while leaving a beautiful, healthy-looking sheen on your skin without a greasy feel. This oil is available in four magnificent scents, corresponding to the flowers that bloom in each season: magnolia in spring, musk rose in summer, carnation in fall, and cyclamen in winter. 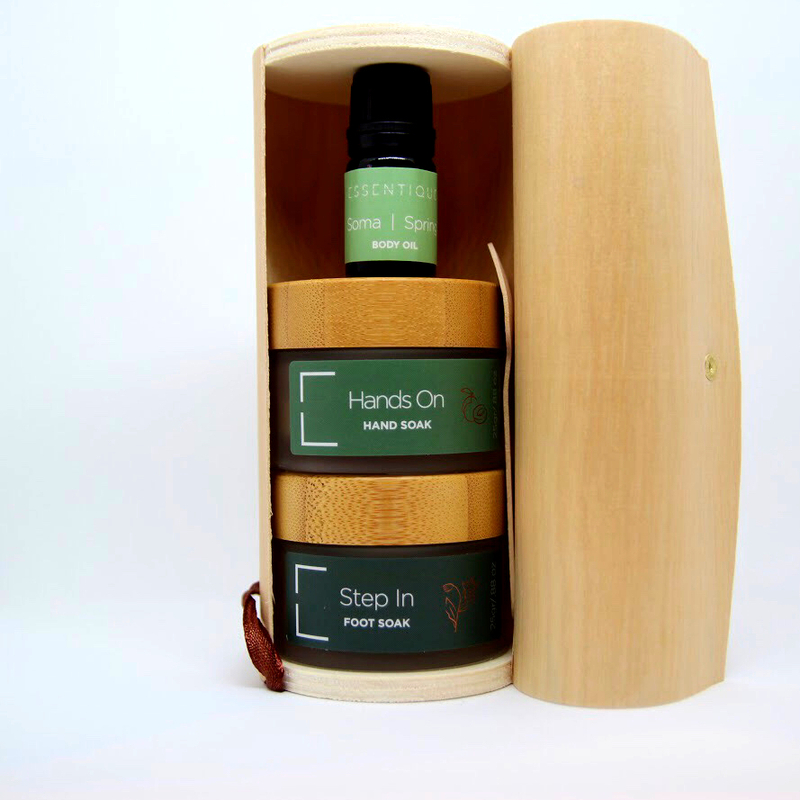 Finish off your hand and foot soak by applying SOMA on hands and feet as a moisturizer. Enjoy! French Grey Sea Salt (Organic), Baking Soda (Sodium Bicarbonate), Colloidal Oat (Avena Sativa), Coconut (Cocos nucifera) Milk Powder, Evaporated Cane Juice and Honey (Organic), Borage (Borago officinalis) Seed Oil (Organic), Pink Rose (Rosa damascena) Flower (Organic), Marshmallow (Althaea officinalis) Root (Organic), Chamomile (Matricaria chamomilla) Flower (Organic), Calendula (Calendula officinalis) Flower (Organic), Lavandin Grosso (Lavandula Hybrid var Grosso) Essential Oil (Organic), Lemon (Citrus limon) Essential Oil (Organic),Tea Tree (Melaleuca alternifolia) Essential Oil (Organic), Rosemary (Rosmarinus officinalis) Essential Oil (Organic), Eucalyptus (Eucalyptus globulus) Essential Oil (Organic), Peppermint (Mentha piperita) Essential Oil (Organic). French Grey Sea Salt (Organic), Baking Soda (Sodium Bicarbonate), Colloidal Oat (Avena Sativa), Coconut (Cocos nucifera) Milk Powder, Evaporated Cane Juice and Honey (Organic), Apricot (Prunus armeniaca) Kernel Oil (Organic), Pink Rose (Rosa damascena) Flower (Organic), Marshmallow (Althaea officinalis) Root (Organic), Chamomile (Matricaria chamomilla) Flower (Organic), Calendula (Calendula officinalis) Flower (Organic), Lavender (Lavandula angustifolia) Essential Oil (Organic), Ylang Ylang (Cananga odorata) Essential Oil (Organic), Lemon (Citrus limon) Essential Oil (Organic), Frankincense Sacred (Boswellia sacra) Essential Oil, Geranium (Pelargonium graveolens) Essential Oil (Organic). Macadamia (Macadamia ternifolia) Nut Oil (Organic), Abyssinian (Crambe abyssinica) Oil (Organic), Jojoba (Simmondsia chinensis) Oil (organic), Rosehip (Rosa spp.) Seed Oil (Organic), Avocado (Persea americana) Oil (Organic), Arnica Oil (Arnica montana, Olive Oil) (Organic), Sweet Almond (Prunus amygdalus dulcis) Oil (Organic) with Centella (Centella asiatica) Extract, Apricot (Prunus armeniaca) Kernel Oil (Organic), Hazelnut (Corylus avellana) Oil (Organic), Proprietary blend of 100% pure essential oils, Vitamin E (100% plant-based d-alpha tocopherol 14,000 IU, coconut oil, vitamin c, jojoba oil.) (Organic), Vitamin D (Vitamin D3 5000 IU) (Organic) (Vegan), Rosemary (Rosmarinus officinalis) Leaf Extract Antioxidant (Organic).